There are literally dozens of different ways to prepare coffee. Every corner of the world has its own preferred methods for brewing up this popular beverage: in America a “coffee” is a usually drip coffee, while in Italy it’s an espresso. There are high-tech machines that do practically all the work for you, and hands-on methods that allow to customize your coffee to your exact tastes. Here are just a few ways that you can brew coffee in your own home. If you love coffee, knowing the various brewing methods is among the basics of coffee. It’s best to grind the beans right before you make your coffee, but if you don’t have a grinder, either buy a grinder or be sure to get the beans ground according to the brewing method you’ll use. It really makes a big difference! This brewing method, the most popular one in North America, has several advantages. It’s the easiest way to make a pot of coffee for a crowd, you can program it to start making your morning coffee before you get up, and cleanup is easy. Once you choose your machine, it does most of the work for you. Your contribution is to use freshly roasted coffee and grind as close as possible to brewing. If you have a roaster, it’s great to get fresh beans. For flat baskets use a medium grind and for cones use a medium-fine grind. You have the option of using disposable paper filters or reusable metal mesh. Some people prefer the taste of paper filtered coffee while others prefer mesh. Paper filters give you easier cleanup while mesh filters mean you don’t have to keep buying filters every time you run out. Really it’s just a matter of personal preference. Brew the coffee according to the manufacturer’s directions. It’s best not to leave the pot on the heating element where the coffee can start to taste scorched: if you want to keep it hot, use a thermos flask. 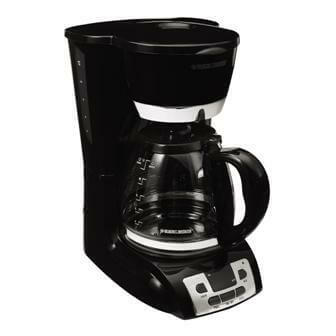 There are many great options available in the market and we have picked the best coffee makers among them. Have a glance if you are interested in this type of method. 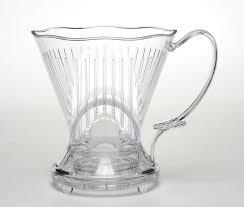 You or one of your college roommates probably used this Pour over coffee brewer at some point. What could be simpler (or cheaper) than just buying a cone that sits on top of your cup, throwing in a paper filter and adding ground coffee and boiling water? So it might surprise you that this is one of the most popular brewing methods among serious coffee mavens. It’s all in the technique. Grind your fresh roasted beans medium-fine and use about 2 tablespoons per 6 ounces of water. Boil your water and wait 30 seconds before pouring to get the right temperature. Pour just enough water to wet the grounds and allow them to “bloom” for 30 seconds, giving the carbon dioxide time to dissipate. Slowly and steadily pour the rest of the water into the cone and allow it to drip through into your cup or carafe. 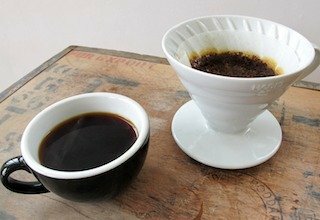 Somewhere close to the Pour Over Method, this method installs a clever stopper on the bottom of the Cup that pauses the extraction and allows full extraction of flavors. It works on the principles of Immersion Brewing, likeways FrenchPress. This method creates no mess no fuss on the table. For this method you will need, a Clever Drip Brewer, 20gm grounded coffee (Medium Coarse), 4 Filter Papers and 300ml of water. Now, pre-heat the Dripper by passing warm water. Place filter papers and put the grounded coffee in it. Pour the warm water evenly all over the coffee and take a break for 1 minute. After that, submerge the floating grounds and stir a little. Now wait for 1.30 minutes more and your coffee is ready. Place the brewer above he serving cup and the stopper will open. Enjoy your coffee! 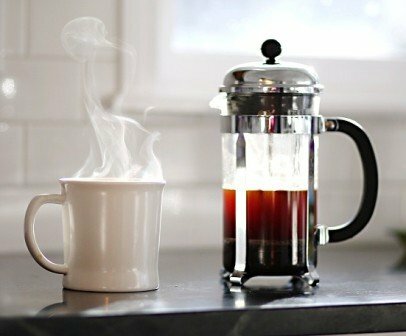 Although it’s a simple brewing method, it’s easy to get French press wrong. If you’ve ever tried making it with pre-ground coffee from the grocery store you’ve probably been discouraged when the resulting brew tasted something like wet sawdust. But with a little attention to detail, you will soon see why so many coffee lovers rave about French press. It’s a portable brewer, so you can take it anywhere on outdoors too. The most important factor is getting the grind right. You want the grind to be quite coarse for French press coffee – if your coffee grinder has a “French press” setting, you’ll see that it’s the coarsest setting, or close to it. You’ll need about 2 tablespoons of ground coffee for each 8-ounce cup, a measurement you can adjust according to your own taste. Warm your pot by swishing some hot water around inside it and discarding it. Boil water and add the ground coffee to the pot. Once the water has boiled, remove it from the heat and wait 30 seconds before brewing. Add about half of the water to the pot. You’ll see the coffee grounds floating to the top of the pot as they bloom. There will be lots of foam and a wonderful aroma. After about 30 seconds, give the coffee a gentle stir to break up this coffee raft, and then add the rest of the water. Wait about 3 or 4 minutes for the coffee to finish brewing. Then gently and slowly push the plunger down as far as it will go. Your coffee is now ready to drink. It’s best to pour the coffee right away rather than leaving it inside the press pot after it’s finished brewing. You can also use a French press to make double-strength coffee for café au lait. Just double the amount of ground coffee per cup and top 1 part brewed coffee with 1 part steamed milk. This method was invented in the mid 19th century and is now coming back into style. Siphon brewing optimizes the water temperature without the need for thermometers, but this method owes a lot of its popularity to its visual appeal. The beakers and burners and gravity-defying liquids will make you feel like an alchemist! Siphon brewing can use either your stove-top or a small butane burner as a heat source, with the butane burner being a somewhat quicker option. There are plenty of expensive siphon pots on the market, but you can get perfectly good results without spending a lot of money on equipment. Grind your coffee slightly finer than you would for drip, but not as fine as espresso. Again, 2 tablespoons per 6 ounces of water is a good ballpark ratio. Pour the water into the bottom pot and place it on the heat. Fit the filter into the top pot and set it on the bottom pot so that it forms a seal. As the water heats in the bottom, water vapor expands and forces the heated water into the top chamber. Once the water starts to come up, lower the heat so that the water in the top chamber is barely simmering. There will always be a little bit of water left in the bottom pot. Once the water level up top stops rising, add the ground coffee all at once and give it a quick gentle stir. Let it sit for 1 ½ to 2 minutes, and then turn off the burner and remove the pot from the heat. As the bottom chamber cools, the air and water vapor will contract, creating a vacuum and drawing the coffee back down into the bottom pot. When the top pot is empty, remove it and your coffee is ready to serve. This method is the youngest of all being invented in 2005 and so people are still doing experiments with this brewing method for improvisation. This method makes a full-bodied cup that tastes rich and bit sweet. 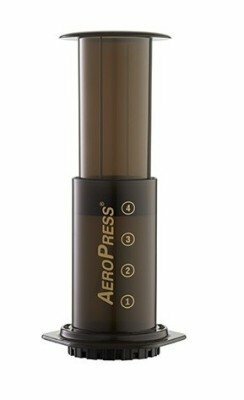 Numerous Aeropress competitions happen around the world and every method contains some variation. For this method, you are required to have an Aeropress brewer of course, Aeropress filter, stirring paddle, fine grounded coffee and a brew vessel. First of all, boil 400 ml of water in the brew vessel. Now put the filter into the Aeropress cap. Measure 17g of coffee for the default taste we prefer. You can add or subtract the amount of coffee as required. Place the Aeropress brewer upside down with the broadened side up. and numbers upside-down. Now put the grounded coffee at the top of the Aeropress and pour double the amount of water to the amount of coffee (Like 17 gm of coffee will require 34 gm of water). Put the stirring paddle and gently stir just a little and leave it for 30 seconds still. Now pour the next half of water, that is 165 gm and again leave it for 1 minute. Next step is to preheat the filter with the remaining water by passing through it. Give 10 stirs to the grounds in the Aeropress. Screw the filter cap on the Aeropress and flip the assembly gently. Now we are ready to push the thing. Slowly and gently push the Aeropress above a cup. Here is a link to the detailed method with pictures. Practically every kitchen in Italy has at least one of these little coffee pots. Both the iconic octagonal design and the more streamlined stainless steel mokas have become commonplace in American homes too. The coffee they make is not quite espresso, but it’s a pretty decent approximation if you’re not ready to invest in an espresso maker yet. Fill the filter basket loosely with ground coffee so that it is slightly rounded. Be careful not to pack it down, as the moka is not designed to deal with this type of pressure and the results could even be dangerous. Brush away any stray coffee grounds from the top of the filter. Screw on the top part of the moka firmly, but don’t over-tighten it. Put the pot on medium heat so that the brewing process is gentle and gradual. Remove the moka from the heat after it starts getting noisy; you’ll get better coffee if you don’t worry about trying to get every last drop of water out of the bottom chamber. Enjoy your coffee black or with sugar in a demitasse cup, or use it to make delicious lattes. 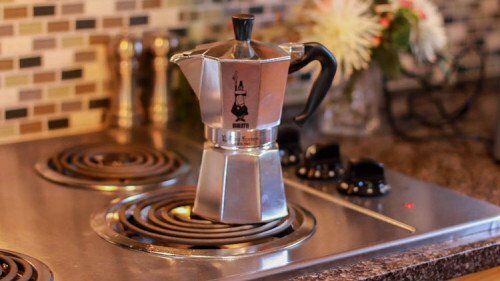 We have a complete guide about How to use a Moka Pot. This is another popular brewing method for people who like very strong, espresso-like coffee but don’t want to get into buying the bulky and expensive equipment. There’s a lot of disagreement about the “proper” way to make Turkish coffee. This is just one method out of many, but it will give you a starting point. Turkish coffee uses the finest grind you’re likely to see in coffee brewing. At a couple of settings finer than espresso grind, it almost looks more like flour than ground coffee. You need a good quality home grinder to accomplish this. 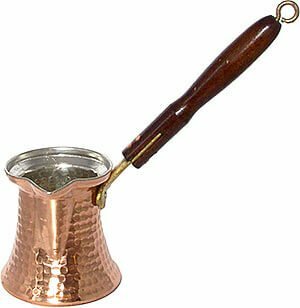 The only other equipment you’ll need is a Turkish coffee pot, also known as an ibrik. This is a small metal pot, traditionally made of hammered copper, attached to a long handle. It’s best to serve Turkish coffee in straight-sided demitasse cups to maximize the foam and allow the grounds to settle. You will also need a heat source like butane burner or an electric or gas stove. Use your serving cups to measure the amount of water you’ll need, making sure you leave plenty of room above the water level in the pot. Pour the water into the pot and stir in about 1 tablespoon of ground coffee for each serving. Add sugar to taste. Turn on your element to medium-high and place the pot on the stove. When the water is heated, the coffee will foam up to about the level of the pot’s rim. (Some people like to skim some of this foam into the serving cups.) Remove it from the heat and wait for the foam to settle, which takes about 30 seconds. Return it to the heat and watch it carefully – this time it will foam quickly and can boil over if you’re not paying attention. Again, let the foam rise to the top of the pot and remove it from the heat. Let the pot sit for a minute or two for the grounds to settle. If you really want to go authentic, or want to tone down the strength and intensity of the brew, adding spices such as cardamom, anise, or a sweetener such as an easily dissolvable sugar can be added. In fact, sugar is almost considered part of the process. The famous old proverb, “Coffee should be as black as hell, as strong as death, and as sweet as love” refers to turkish coffee, and you’ll note the sweet part. Pour slowly into serving cups. There will be some grounds in the bottom of your cup, but that’s all part of the experience. For many people, there’s just no substitute for real espresso. It’s a big undertaking and a major expense to buy an espresso machine and grinder and then to develop your barista skills, but for many espresso aficionados this is in no way a drawback. Once you’ve chosen your equipment and set everything up according to specifications, it’s time to start experimenting. An espresso grind is very fine, about the texture of table salt. Grind about 20 grams into your portafilter for a double shot and level it off with your finger. Tamp it evenly and firmly with a good tamper – this will take practice. Some people even practice using a bathroom scale to see what 30 pounds of pressure feels like! Run some hot water through the grouphead to make sure the temperature is hot enough before attaching the portafilter and positioning the cup. When you activate the brewing process you should see a stream of dark coffee that gradually gets lighter in color and tapers off after about 25 seconds. A skilled barista will know when the grind needs adjusting, or how to use the tamper to compensate for other factors. Don’t be surprised if your early creations don’t taste as good as you would like. Just keep at it, experiment, and be patient.